Whatever else can be said about F1, it never loses its capacity to surprise. Take Haas. In pre-season's first few days the team hardly was mentioned. Apparent nondescript plodders in a congested midfield, and perhaps somewhere near the ceiling of its buy-in-and-outsource-everything-you-can model. Sauber's closer ties with Ferrari likely wasn't good news for it either. There was little visually in the car launched to make you reassess, beyond that it contained a clear Ferrari influence. But it was far from alone on that. Yet we'll go to Melbourne almost expecting Haas to be best of the rest behind the big three teams, certainly in the mix with the likes of Renault and McLaren; well capable of points and perhaps big hauls of them. Somehow the car appears to work. Towards the end of Barcelona running it was setting laptimes mere tenths off the Ferrari and the fuel loads were understood to be similar. Team owner Gene Haas sounded fanciful when he set the team the target of being within half a second of Ferrari based on its partnership with the Scuderia. Suddenly he sounds less so. Of course a few health warnings apply. There's the habitual one about testing headline times. Plus a general major weakness of Haas so far in its brief time in F1 is that its competitiveness can vary wildly between circuits, so perhaps Barcelona in February was peculiarly good for it. It likely will be out-developed by those rival squads mentioned in-season, so it needs to make points hay while the sun shines early on. Yet team principal Gunther Steiner aims higher, and thinks fourth in the final constructors' table can be claimed. One may speculate that an early podium can be scavenged if cards fall its way. Maybe it indeed is all a mirage. But as things stand Haas has a right to hold ambitions that prior to testing would have seemed from another world. The late rounds of 2013 now feel a long time ago. Then after a series of strong runs for Lotus, almost alone in challenging the Red Bulls, we thought Romain Grosjean was the next to join F1's top table of drivers. Somehow since things stagnated. 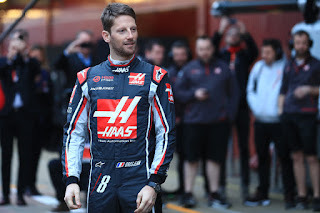 Lotus ran out of money and produced poor cars, and exasperated at this and that big teams weren't taking the plunge with him Grosjean shook things up as well as hoped to get into Ferrari's eye-line by moving to the newbie Haas team for 2016. Matters haven't really moved on in his two years there though, with the spell distinguished mainly by his complaints on his team radio broadcast on TV about handling and particularly brakes. It has given rise to two queries: should he not have sorted it by now and more fundamentally is he in his braking asking for more than the car is capable, which is pointless? There is a growing consensus on the latter point. Observers note that he carries more speed into corners than others. On occasion last year he showed what was possible when the Haas was working with him and/or he didn't over-drive, not least with sixth on the grid in Melbourne and finishing in that position in Austria. 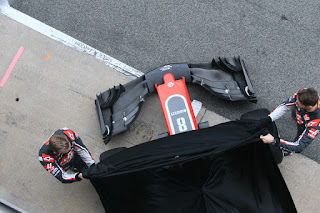 One can only hope that if his Haas is as good as we suspect for this year it'll let him rediscover the considerable potential we glimpsed nearly five years ago. 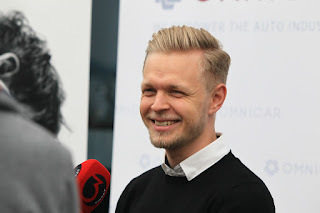 The peripatetic Kevin Magnussen arrived at Haas last year - his third F1 employer in three seasons in a race seat - hoping to put roots down. Such nomadism isn't a good sign (remember Andrea de Cesaris? ), yet Magnussen can claim a hard luck story on some level. After arriving in a McLaren race seat as the next big thing he was dumped rather unsympathetically after one season at the wheel (then being left in limbo for a year), and things got little better with his 2016 campaign in the late patch-up job at Renault. It hardly helped that both teams murmured that he wasn't committed or disciplined enough and erred too often. But now at Haas things may be coming right for him. Despite scoring fewer points than Roman Grosjean last season he seemed the more consistent; certainly was less troubled by the car's sometimes dread handling. He also wasn't deserving of the 'bad boy' reputation he developed as the year went on, but still there was occasional scrappiness that cost better results. Speed and potential were present too however, not least in Azerbaijan – where he ran as high as third – and a stoic drive to points in Mexico. Some indeed rated that last one as the best drive of anyone all last season. Now for the first time in his F1 career he has a second year in a race seat with all the benefits that brings. Plus if the car is indeed good and he continues to sneak ahead of Grosjean with consistency (in more than one sense of the term) then he could at last live up to his glowing reputation from the junior formulae. Hi, I do think this is a great website. I stumbledupon it ;) I will return yet again since I book marked it.